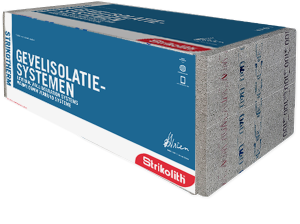 As rigid foam insulation in Strikotherm COMFORT exterior wall insulation systems. The insulation boards can be fixed to almost all solid, load-bearing surfaces that are free of movement. The insulation boards are seamlessly bonded with Strikotherm adhesive mortar to the underlying structure in such a way that the edges of the boards are completely glued and that an evenly distributed surface is created with at least 60% bonding. The insulation boards may, where indicated by the Strikotherm recommendations and B.R.L. 1328, and after drying (48 hours), be additionally fixed with Strikotherm Spreidpluggen expansion inserts.